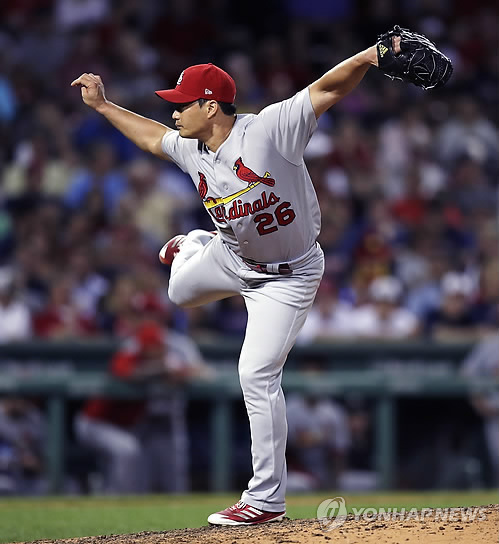 SEOUL, Aug. 19 (Yonhap) — Oh Seung-hwan of the St. Louis Cardinals has earned a save for the first time in 41 days as he escaped a bases-loaded jam to preserve his club’s victory against the Pittsburgh Pirates. Oh gave up an unearned run in the ninth inning against the Pirates at PNC Park in Pittsburgh on Friday (local time) but collected his 19th save of the season as the Cards hung on to win the game 11-10. This was Oh’s first save since he picked up his last one on July 8 against the New York Mets. With his latest performance, the right-hander lowered his ERA from 3.74 to 3.69. He also has one win and five losses this season. Oh was the Cards’ third pitcher to appear in the ninth. With the Cards leading 11-8, Matt Bowman got Jose Osuna on a fly ball to right field, but walked two batters straight and hit another to load the bases. Zack Duke replaced Bowman, but the left-handed pitcher also gave up a walk to Josh Bell and let the Pirates cut the deficit to 11-9. Oh then came up on the mound to secure the lead. The 35-year-old South Korean started the inning with a sacrifice fly to David Freese, which brought the Pirates within one with the tying run on third base. Oh next intentionally walked Adam Frazier to load the bases and faced Elian Diaz. On a 2-2 count, the Korea Baseball Organization’s all-time saves leader got Diaz swinging on a slider to wrap up the game. With Trevor Rosenthal now on the disabled list, Oh is expected to regain the closer role that he served during last season. He went 6-3 with 19 saves in 76 games last year, marking a 1.92 ERA.